Capped by Jiaodaokou South Main Street to the east and Nanluoguxiang to the west, the 400-meter Ju’er Hutong, like many other lanes around this area, dates back to the Yuan dynasty. 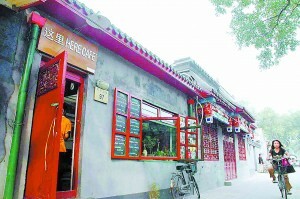 Because this hutong is narrow and long, like a centipede, Ju’er is also called Centipede Lane. During the Qing Dynasty, this was the gathering place of the Xiang Huang bannermen, an upper class brigade of the eight banners commanded by the emperor. For an additional elite historical claim, addresses No. 3, 5 and 7 held the former residence of Rong Lu, the provincial governor and minister of war during the late Qing Dynasty.